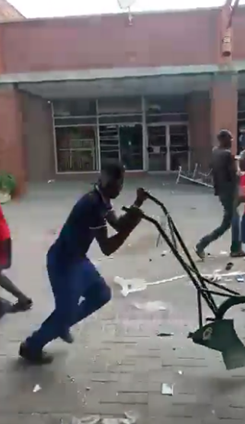 The young man who looted a plough from a shop at Entumbane Shopping Complex in Bulawayo has been jailed for five years. Polite Weza (35) of Emakhandeni suburb was convicted on his own plea of guilty to public violence and theft. Weza will serve an effective four years after one year was suspended for five years on condition that he does not within that period commit a similar offence. The magistrate condemned the violence and said perpetrators deserved a custodial sentence to protect society from acts of terror and lawlessness. “The accused person engaged in acts of violence which should not be condoned. Sending such people to jail would deter would be offenders,” said the magistrate.